Earlier this year I was given the opportunity to piece a few quilt tops for Spring Market for Miss Rosie's Quilt Co. And while I enjoyed making all the tops, and completely totally fell in love with the finished quilts, I didn't want to blog about them until the patterns were available to you, and now they are, and so I am! First up, Freddy! This quilt is named for Freddy Moran, an amazing quilter who taught Carrie Nelson, among other things, "that through piecing and appliqué you're are essentially creating your own fabric" And that's what Carrie told me to do when I started piecing this top, take the Denyse Schmidt fabric and create new fabric. Since I tend to overthink and over fuss with the fabric for my own projects, I think I would have totally freaked out over the fabric placement for a market quilt if it were not for this advice. Advice I've used on every project since. Click here to see awesome Freddy Moran quilts on Pinterest. It finished at 81" x 81"
It has approximately 1,632 pieces. This quilt can have a lot of different looks depending on your fabric choices, two colors, like this one, maybe entirely scrappy (great scrap buster) or maybe 9 different colors. You can use fat quarters, (23) or fat eighths (54). And this is what Freddy looked like at Market after being beautifully quilted by Diane Tricka. I love what Diane did with the open space between those blocks, all the blocks. Another quilt I pieced was Crop Circles. When Carrie asked me to piece this quilt I said no, I can count on one hand the number of appliqué projects I've completed, and I sure didn't want my lack of appliqué skills on display at Market. Carrie then asked if I would at least piece the arcs, to save her some time, and she would appliqué the blocks. Well once I started making this top there was no way I was going to let anyone else finish it, the appliqué was a breeze, and I didn't hear a single rumor at market that it looked like it was appliquéd by someone who can count on one hand the number of appliqué projects they've completed, so all is well. I worked on this top in February, here in the midwest we had a very brutal winter, I rarely even left the house, but working on this happy project lifted my spirits and kept the winter blues at bay. Have you been looking for the perfect project for that April Showers bundle you've been hoarding, look no more! It finished at 76" x 78"
It has approximately 1,010 pieces. This is what the top looked like all finished in my sewing room. And this is what the quilt looks like now, after also being quilted by Diane Tricka. I was very pleased and in love with this top when I finished piecing it, after seeing it at Market all quilted, I about cried. It's one of my top ten favorite quilts for sure. This pattern is also fat eighth or fat quarter friendly. Besides Crop Circles and Freddy, Miss Rosie's Quilt Co has two other new large quilt patterns from Market that are available, Sugarboo and Seven Letters. Paper or PDF versions are ready for purchase here. To celebrate the release of the new patterns I'm giving away any Miss Rosie's Quilt Co pattern, your choice. Of course I'm hoping you'll select a new one, because really, don't you want to make a Freddy or a Crop Circles, but they're all winners. Anyone may enter the giveaway, but if you win, and don't live in the US, your selection needs to be a PDF pattern. Just leave a comment on this post telling me what fabric you would use to make your own Crop Circles or Freddy, or maybe you would go with the fabric I used, and that's OK too. You have until Friday to enter. I am not an employee of Miss Rosie's Quilt Co and this is not a sponsored giveaway, I'm paying for and giving away the pattern. While I am fortunate enough to call Carrie Nelson a friend, when it comes to work and the business side of things I'm more of a minion, volunteer, or nuisance, and that suits me perfectly. Please don't enter me in the drawing. I just wanted to say that being a minion to and working with Greatness is so inspiring! Lucky you! The quilts are absolutely gorgeous. All of her new quilts are on my to-do list. When I saw them at market, especially these two, I immediately ordered up fabric for them. Stunning! Beautiful choices of fabric for your projects. I would pick a Ms Rosie I could do scrappy. I'd love to do either quilt! As to what fabric, for Crop Circles I'd go with either something American Janey (so easily defined!) or Kaffe! I think on Freddy it'd have to be red/white or blue/white for me. Congrats on being asked to piece for Market! I love the use of April Showers for Crop Circles. I would love to make that pattern. Your finishes for both patterns are beautiful! Congrats! I'm not usually a fan of 30's reproductions, but they are what I think for Crop Circles. My favorite is Crop Circles and I'd do it scrappy. Thanks! I might just have to use my April Showers fat quarter pack and make Crop Circles. Both quilts are beautiful. I would make Crop Circles out of the new Somerset line by Fig Tree. Of course, I would have to wait until it actually shows up int the stores. I love Freddie. I think I'd try to do it out of my stash in peaches and greens. OH my goodness Thelma...these are spectacular! I love them! I would probably want to do each block from different colours of scraps for the Rainbow Scrap Challenge... I love making quilts that way. Thelma, the quilts are stunning. The fabric you "Created" for Freddy is wonderful! I have been waiting for Crop Circles pattern to come out - but also am a little freaked out about applique`. You just convinced me to give it a try! Anne D.
I love both of those quilts but then I love all Miss Rosie quilt patterns. I think I would do Freddy and use my stash of Hearty Good Wishes fabric anything that looks like the sea is my fave. 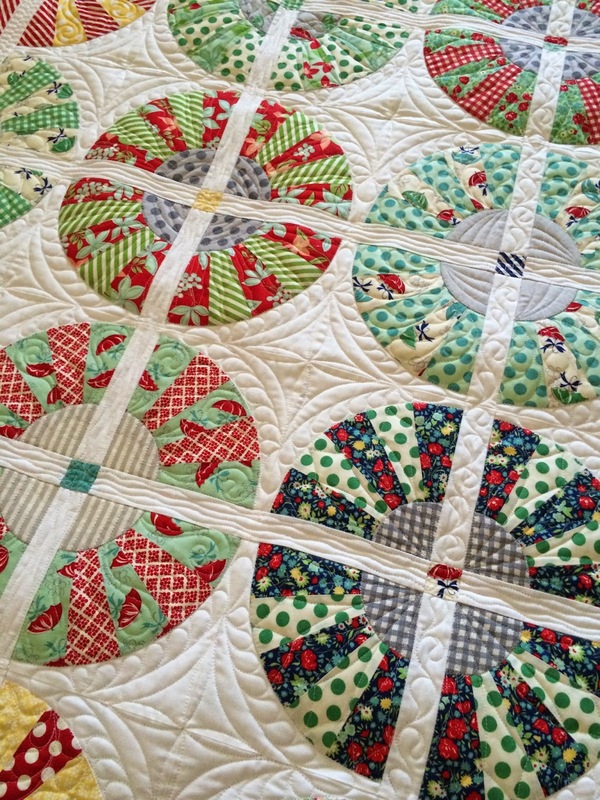 The crop circles quilt is BEAUTIFUL! Your Crop Circle quilt is beautiful! I love your fabrics, too. Thank you for the giveaway; Carrie is lucky to have such a skilled minion. I would choose the Freddy pattern or any other pattern that would allow me to use up more of the many scraps my mother left behind. Having so much fun making charity quilts with love from my mom. I love Bonnie and Camilles fabric lines, so I would probably go with April Showers. 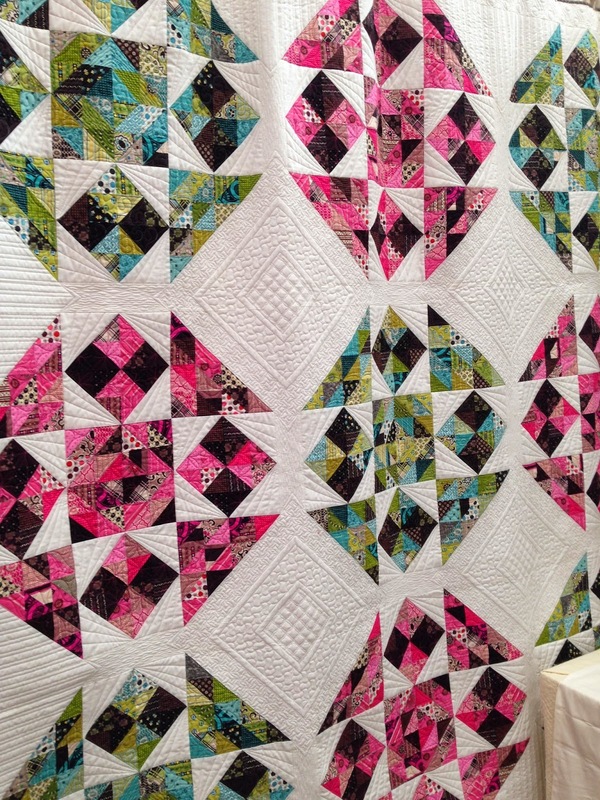 WOW you did a BEAUTIFUL job on piecing these quilts! I can see why you didn't want anyone else to finish the second one! I love both patterns and collect (more like hoard) Bonnie and Camille's fabrics!! LOVE LOVE LOVE them! I'd definitely chose the Crop Circles pattern. Now I know what I'd use my April Showers fabric for!! Such a cheerful quilt! The new patterns are absolutely wonderful! I think Freddy is my favorite. I have a bunch of leftover Safari Moon (Frances Newcombe) that would look great worked up in the Freddy pattern! I love these quilts! I would probably choose to do Crop Circles in Color Me Happy! They sort of remind me of life savers candy! Both are so beautiful, great job, Thelma! I think you can never go wrong with Bonnie & Camille fabrics but since you already choose them to make Crop Circle I think it would look equally amazing in Fig Tree fabriccs (never can go worng with these either). And I think Freddy would make a great xmas quilt perhaps with a bunch of red, greens and aquas. WOW they both turned out beautifully. Your piecing ability and her quilting skills go well together. 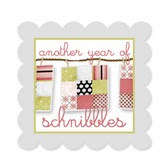 I am a scrappy type of girl and I love the Schnibble patterns so I would probably pick one of those. Thanks for sharing and thanks for a chance. I really like Crop Circles. I think 30;s fabric or anything by Bonnie and Camille would look great with it. Love both your quilts. They look wonderful. Beautiful quilts, Thelma! Since I am banned from buying fabrics for a loooong time, I guess I would have to go stash diving. Controlled scrappy? I would love a Christmas quilt. I need to get on it and make one for myself. Your work is always so beautiful, Thelma. Thanks for the chance to win a pattern. These are wonderful! Carrie writes the best quilting patterns, bar none. You execute them brilliantly. The new pattern that I can see myself making is Seven Letters, though your Crop Circles has me considering an appliqué intervention. Wonderful quilts Thelma! I would love to be a minion, volunteer, or nuisance! ~you are very lucky! :-) I have been hoarding :-o some Jo Morton prints and I think I'd use them in one of the new patterns. They all look like fun! Thanks for the chance! Crop Circles is a lovely pattern...would love to try my hand at it with fabric I have dyed with natural dyes....the "solids" could prove to be interesting in the design. Love both patterns. I always love anything by Carrie Nelson. I would make Crop Circles using Miss Kate by Bonnie & Camille. I really like Crop Circles. I'd make it in a variety of Kaffe fasset fabrics. I think I would make Crop Circles and use scraps, I'd like it to look old fashioned and vintage. I don't think I could come close to your fabulous piecing, though. I've been hoarding a Scrumptious fat quarter bundle and Freddy is calling my name! Love the crop circles quilt – and you make it sound easy! I would use my scraps to make crop circles. “Make your own fabric” is great advice; I will remember that. The Freddy quilt is awesome too – I would make it in Terra Australis fabric with a dark background. If I were to make crop circles I would use some Kaffe Fassett fabrics. I love Crop Circles and if I was to make it, I would use my 30's and feed sack fabrics that I have collected. I will definitely make Crop Circles and I'm thinking of using Best Day Ever or Fancy. They're both bright and cheery collections and perfect for summer. Carrie's patterns are always wonderful. Oh, your quilt is just beautiful! Miss Rosie sure had plenty of wonderful patterns, but I think I would chose Crop Circles, and use some Denyse Schmidt, or 30's fabric! What an honor to have Carrie ask you to sew for her, but your work is always spectacular. I'd probably choose Crop Circles. I purchased Crop Circles as soon as it was available and can't wait to get started on it. I need to collect a few more fabrics first, though. Your quilts are gorgeous, and now I think I must have Freddy, too. I love Crop Circles and April Showers makes the quilt so cherry and happy looking! Crop Circles in Kate Spain's Sunnyside would be pretty. I'd like to try to challenge myself and would choose Crop Circles using Social Club by Eric and Julie Comstock (Moda Fabrics). Thanks for the giveaway, Thelma!! Your quilts you have been working on have inspired me to try some curved piecing, even though you said crop circles is appliqué I would love to give it a try . Please pick me! Thanks for the chance to win . Your work is wonderful, you should be proud. Oh dear forgot to mention the fabric, I have a new bundle of daydreams by Kate Spain waiting for a project! AMAZING quilts and quilting! I love them both - I think the crop circles might be at of my comfort zone - so impressed you always try new techniques. So I think I'd go with Freddy and I might use my Florence fat quarters I've been hoarding! Get giveaway! I just love the Crop Circles pattern! Would love to make it for my grand daughter. Not sure which fabric line I would use right now but would use something with bright pinks, teals and yellows. Thanks for the giveaway! I don't know (yet!) what fabrics I'd use, but I'd totally go with Freddy. What an abnegation ! I am in love with Freddy, you're definitely the best ! I am a quilter, wanting to meet my own requirements, and now after admiring your tops, I am deciding to stop quilting and look for an other hobby for I'll never reach your level ! especially love the Crop Circles! Thanks! What beautiful quilts and amazing machine quilting too. I like Civil War repro fabrics, so would choose them for sure - maybe pink and brown for Freddy, and scrappy for Crop Circles! I love crop circles and will make it with Miss Kate! Thanks for sharing your beautiful work! I just love these two patterns and I love your completed versions even more! I already purchased Crop Circles and can't wait for the fabric to appear in my mailbox this fall to start work. Freddy is just as wonderful and I think I would use a mix of French General lines for a soft scrappy look. Fabulous post! I have admired Crop Circles whenever I've seen pictures of it online. So lovely! I have some Pam Kitty Morning Picnic fabric stashed. I think it would be fun to see it made up in that color way! I would love a PDF copy of Crop Circles! I am a huge fan of Miss Rosie! I would make it in Miss Kate fabric by Bonnie and Camille. Thanks! A Miss Rosie pattern and Fig Tree fabric would be a match made in heaven! I would make Crop Circles with Kate Spain's Cuzco fabric. I bought the fabric some time ago and this quilt would look great with this fabric. Thanks for the chance. I love your work and am really liking the different fabrics you are using. Crop circles has been on the list since I saw market pics. I have some Paris flea market or Tanya whelan florals that might look good. Thanks for the opportunity. I've taken a couple workshops from Freddy Moran and have enjoyed them immensely. I think I'd take all of my red fabrics and make the Freddy fabric and quilt. I'd love to win the pattern. Thanks for the inspiration. Crop circles is an amazing quilt. From the fabric choices to piecing and finally quilting it is incredible. Just a tad behind on this one but I LOVE LOVE LOVE Freddy! The quilting just kicks that piece up a notch and makes is even more gorgeous. Crop circles is very yummy too but I find it to be on a different level than Freddy. It's more of a cozy, worm, snuggly quilt that I would always have on my sofa. Both are just gorgeous. I would tackle Freddy first because, as I said, I love love love it. And I would HAVE to use Denyse Schmidt fabric too. It is just too perfect to mess with it. For Crop Circles, maybe some Vintage Happy by Lori Holt. I would try Crop Circles and use Pat Sloan's fabrics. 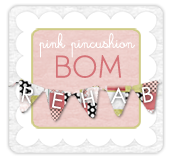 Maybe Bobbins & Bits or her new line that's coming out! I think I would choose Crop Circles. Loving the fabric you used or would go scrappy from my stash. Thanks for the chance to win!